Gastroschisis and exomphalos in Ireland 1998–2004. Does antenatal diagnosis impact on outcome? Antenatal detection of anterior abdominal wall defects (gastroschisis and exomphalos) enables detailed prenatal planning and counselling with appropriate intrauterine transfer, delivery in a tertiary referral centre with prompt access to paediatric surgery and early surgical intervention. The authors believed that there was a relatively low rate of antenatal detection in Ireland and that an improved antenatal screening program would allow increased detection thus avoiding emergency retrievals from peripheral obstetric centres. Our hypothesis was that there was a significant difference in management and outcome in children with anterior abdominal wall defects detected antenatally and those detected at birth. All anterior abdominal wall defects in The Republic of Ireland are assessed and closed in two surgical centres, Our Lady’s Hospital for Sick Children, and the Children’s University Hospital, Dublin. A retrospective review of all admissions in both centres revealed 96 neonates with anterior wall defects (excluding bladder exstrophy and cloaca) over a 7 year period from 1998 to 2004 inclusive. Medical records, operative reports, neonatal databases and admission details were reviewed. The antenatal data search included anomaly detection, prenatal management plan and intrauterine transfer. Perinatal data included place of birth, weight, gestational age, mode of delivery, time to surgery and type of surgery, the time to establish full enteral feeding and the length of hospital stay were used as overall markers of outcome. Fifty-three patients had gastroschisis and 43 exomphalos with an antenatal detection rate of 53% (n = 28) and 34% (n = 15), respectively, with an overall detection rate of 44%. There was no significant difference in the median birth weight (2.83 vs. 2.85 kg), gestational age at birth (37 vs. 37 weeks), time to full feeding (12 vs.14 days) and length of stay (20 vs. 17 days) between those detected antenatally or postnatally, respectively. 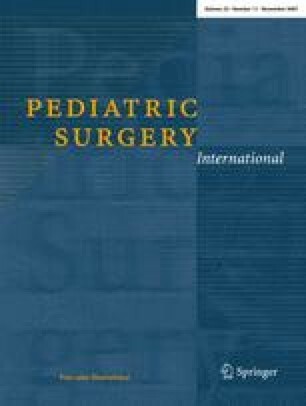 About 77 had a primary closure performed of which 63 infants had surgery within the first 24 h of life. There was no difference in the time to surgery, frequency of complications or the surgical outcome in either group. Intrauterine transfer did not affect any outcome measure assessed. The demographics and the presence of associated anomalies did not differ between the groups. The hypothesis that antenatal diagnosis in anterior abdominal wall defects improves outcome has been demonstrated to be false. Despite this result, the importance of antenatal screening and prenatal management of complex foetal conditions with consultation with experienced paediatric and neonatal staff is without doubt.